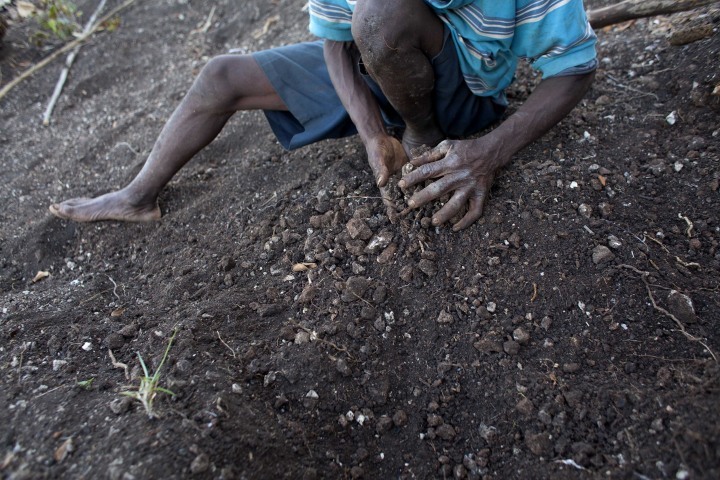 BOMBARDOPOLIS, Haiti (AP) — Jean-Romain Beltinor plunged a hoe into the rocky dirt on his parched hillside to prepare for planting seeds he does not have. Jeanilia Jean-Baptiste 38, stands in the entrance of her home, surrounded by 5 of her children, during an interview in Bombardopolis, Haiti. Jean-Baptiste said she received a $35 government handout in September. “I spent the money on school tuition, shoes for my children but it wasn’t enough,” she said. 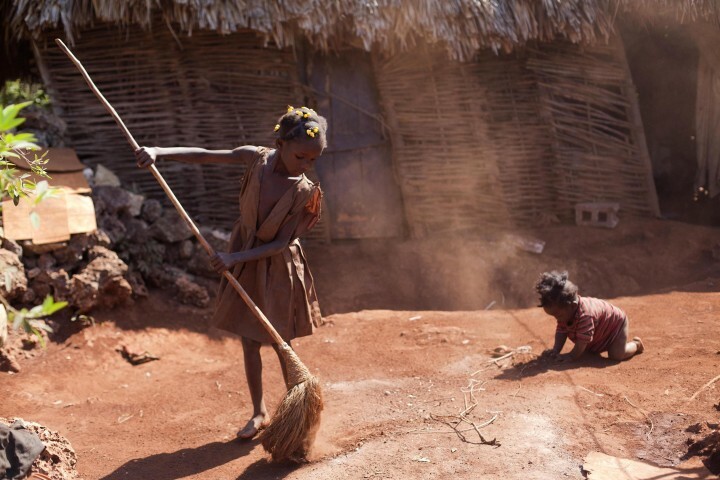 Larionise Beltinor 10, sweeps the entrance of her home while her 7-month-old brother Jean Widson Beltimor crawls nearby in Bombardopolis, northwestern Haiti. Drought is hitting this region, one of the hungriest, most desolate parts of the most impoverished nation in the hemisphere. Officials hope to tide people over through the rainy season that is supposed to begin in April and until harvest in June. Farmer Jean Romain Beltinor, 59, works the rocky dirt on his parched hillside to prepare for planting seeds he does not have in Bombardopolis, northwestern Haiti. 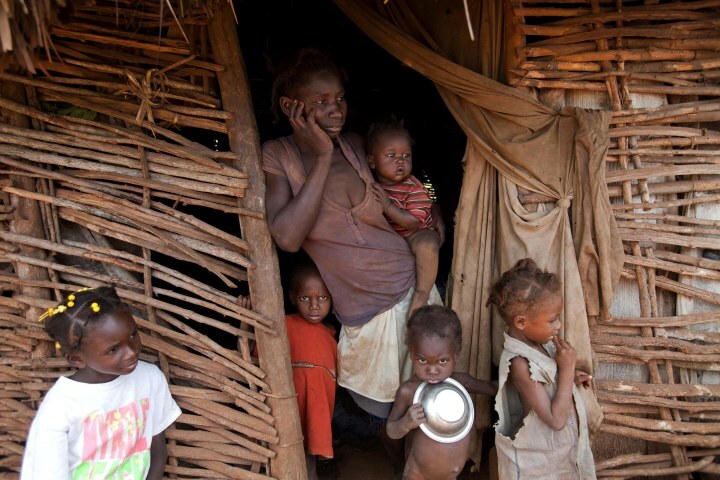 After months of drought, the subsistence farmer struggles to find food for his 13 children. To earn a little money, he must turn to cutting what little wood remains for charcoal. Je me sens révolté, révolté car cet article prend en compte les caprices d’un clic ou d’un groupuscule qui cherche par tous les moyens a satisfaire leur besoin. Je suis de ce coin de terre, je reste et demeure attaché a cette zone. Et je demande aux promoteurs des besoins non définis de clarifier c’est quoi exactement la Faim? Une famine programmée pour résoudre les problèmes des promoteurs devrait être perçu comme irrecevable.. Lecteurs avisés soyez vigilants! Your comment is not in line with the realities of the situation. 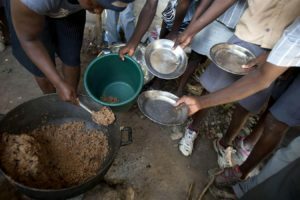 At this moment, there is a rapidly increasing danger of real avoidable famine in parts of Haiti. We are not against the Martelly/Lamothe governement but it would seem that some of their people are not dealing with the requirements of the situation. There is a dangerous shortage of seeds for this coming rainy season. Without seeds there will be no crops and without crops there will be hunger. The degree of hunger is somewhat relative. However, if the peasants have eaten their seed stocks this shows a truly threatening situation. The Haitian peasants need help, not stupid comments.